Love, Lies And Typewriters by Heather Blanton is a charming historical romance. Set in 1943 at the height of the second world war, fact meets fiction within its pages. War bonds and fairytale romances were what the American people wanted to see. The novel shows the power of prayer. God always answers prayer but not always in the ways we expect nor in our timing. We need to surrender our lives and plans to God whose hope for us is so much greater than our own. Appearances are key. The American people wanted good news stories in times of war, as they lifted morale and spirits. External appearances seemed more important than internal. For true peace, internal appearances needed to line up with God’s plans. The novel has a wonderful family feel about it as Lucy has a loving father. The reader can equate him with our Heavenly Father who always wants the best for us. War does not bring good news. Those on the home front worried for their family fighting in Europe. This concern is captured in the novel. 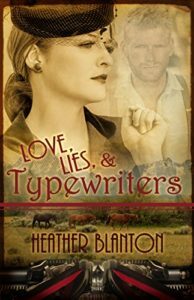 Love, Lies And Typewriters was a charming read for a dreary autumnal day and I enjoyed it. Julia, that is such a great review, and not just because you liked Love, Lies, & Typewriters! You caught all the spiritual elements. I had one reviewer say the the faith element was present, but not very strong. I know I can’t please everybody, but I thought the issue of faith in Christ was “shown” rather than just preached. Thank you so much for seeing the depth. And it is a wonderfully w-written review. Thank you! Thank you so much for featuring Heather and her latest book. Have a blessed Christmas! Love this review. I also thought the book had deep Christian meanings. Great job. Thank you, Connie. Your support is so precious to me!